After dipping out on both Ring Ouzel and Hoopoe earlier this month, I didn't feel much like checking out the alerts this morning. However, when I finally crowbarred myself out of bed, I found an unusually combination in the RBA feed; "Clyde" and "**". Suddenly, getting dressed seemed more important than my morning cuppa. Thankfully the gear was still packed from the Loch Garten trip, so within minutes I was in the car. I nipped in to "On Your Bike" to see if fellow Cumbrae birder, Sean, could get some cover, then we were off to Loch Thom. After scoping out the island with no success, we headed half way up the hill to where we'd noticed another group of birders (which turned out to be the regular Lochwinnoch crowd). Tripod up. Scope on. Bird. Fastest tick ever. 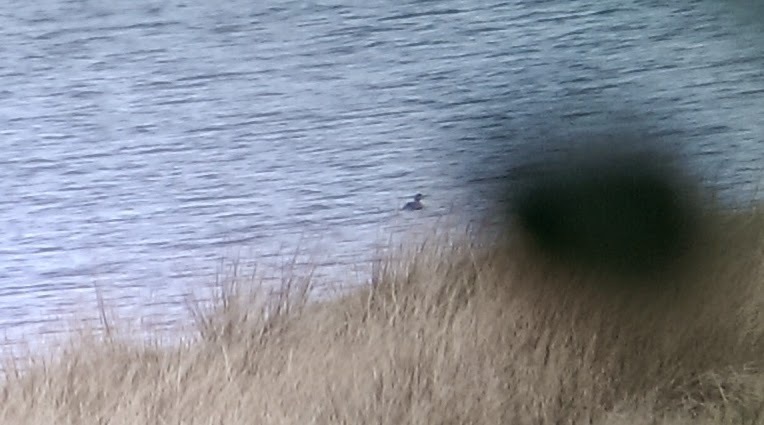 Also, worst phone-scoped image ever - but you get the point. Tiny bird, massive head, stubby little beak. Faith in following shouts restored. I might even go out again tomorrow. Excuse the water droplet blur!